Once a slaughterhouse, now a major on Prague cultural map. Although hard to believe, that is what happened to Jatka78, a multifunctional building that offers space to both visual and theatrical art. Inside the walls there are a gallery, a theatre and a training hall where new circus and physical projects, both Czech and foreign, can do a rehearsal and then stage their shows, using the technical equipment offered by the center at request. 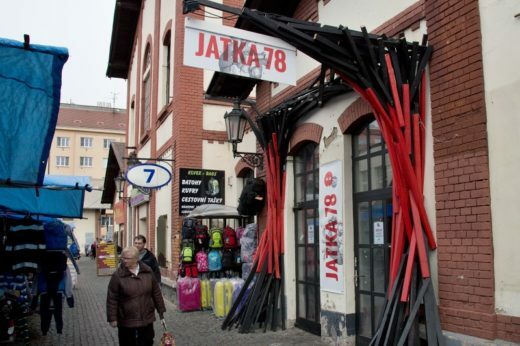 Jatka78 has become the home stage for Cirk La Putyka, a professional new circus troupe. That blurs the line between acrobatics, modern dance and sports genres. Other starred groups are 420PEOPLE a contemporary dance company, and 11:55 which perform theater shows. You can find it in Prague 7, just after crossing the Vltava river! Music is played in the club fitted with powerful Hi-End audio equipment and the agenda counts six to eight performances a month, presenting the international independent music scene. The theatre program focuses on contemporary prose, as well as experimental interdisciplinary projects, often involving visual artists, musicians, or non-actors. Finally, the three galleries (MeetFactory, Kotska, Wall) inside the building offer space for a critical confrontation of the national and international art scenes. The MeetFactory Gallery focuses on original curatorial projects, while the Kostka Gallery presents solo shows of emerging and established artists. Last, the Wall Gallery, a side-facade of the building, comprises of large-scale realizations beyond street art. Meet Factory also held the largest Artist-in-Residence program in the Czech Republic. MeetFactory facilitates fifteen studios and annually host over thirty among visual artists, musicians, or writers, allowing them to realize live performances inside its spaces. Not too far from Smíchov tram and train station, you can find Meetfactory! In recent months, Prague’s Holešovice district has transformed into an epicenter of creative businesses to which people travel half the city to visit. 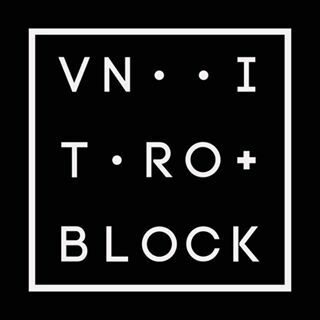 A fresh example is VNITROBLOCK – an old factory hall converted in a multifunctional space with an industrial atmosphere where you can grab some coffee, buy original clothing and design objects for your flat, or take in an interesting contemporary art exhibition. They also hold occasional shows of new fashion collections and various workshops. It counts 8 different spots among shops, cafes, cinemas, dance studio, here’s a complete list! Drop off at Dělnická tram stop and you’re there! “In an age when growing numbers of people tend to think dangerously alike, art’s capacity to suspend, even for a moment, our habitual ways of seeing, may well prove to be of its greatest value.” The gallery’s motto suggests quite a bit about its goal and identity. 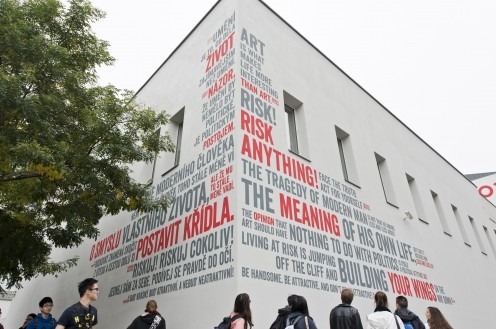 Through exhibitions of contemporary international and Czech art, DOX aims to create a space for research, presentation, and debate on important social issues, where visual arts, literature, performing arts, and other disciplines encourage a critical view of the so-called reality of today’s world. The very name of the gallery, DOX, is derived on the Greek word “Doxa”, which among other things means a way of perceiving things, an opinion, a conviction, so to underline the mission to investigate the ways through an opinion is formed. The building’s conversion from an old factory into a multifunctional space is an example of exceptional world-class architecture, as evidenced by its nomination for the prestigious Mies van der Rohe Award. In addition to its extensive exhibition spaces, there’s also a café, a bookstore, and a design shop. New to the DOX is its wooden rooftop zeppelin Gulliver, which is primarily a meeting place for contemporary art and literature, making it a perfect place to spend a day surrounded by an alternative and cultural environment. That place is bold, starting from its walls! This multipurpose cultural space in Prague’s Holešovice district came to life through the interconnection, reconstruction, and completion of a number of early 20th-century factory buildings. 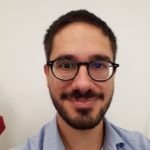 Its originality is imprinted in its theatre projects, which balance on the edge of new circus, physical and movement theatre, and various experiments. It counts two studios, a bar and a gallery. The first studio is conceived as a black box, allowing variable use for theater, dance performances, concerts and many other activities of all genres. The second was completed in 2012 and features a sliding auditorium and movable partition walls, which can also be used as projection screens. The bar is adjacent to the Studio 1 and is equipped as well with its own stage for smaller cultural productions. The gallery surrounds all the above-mentioned spaces. Besides its original function, it is used for smaller film projections, such as a small theater hall, a test room, or a lecture room. 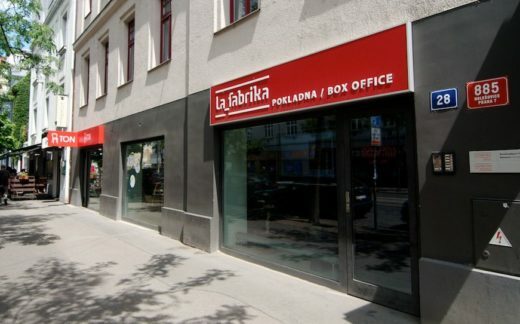 Near the Dělnická tram stop, you can find La Fabrika too! Now, for sure Prague has one of the best public transport in Europe, but the places of underground culture are often found in the suburbs. All these places mentioned before make no exceptions to this rule. A car could be surely useful, if you plan to buy one you will also need a driving licence, about that we can help!